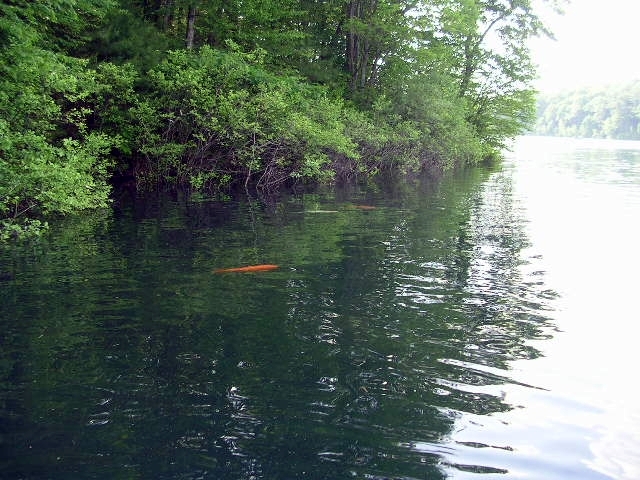 One morning years ago, probably in the 1990's, I was walking along the beach at Walden Pond when I spotted, in about two feet of water over the sand, a ridiculously large fish. I was really startled! Subsequently, I was informed by then Park Ranger Dan Kuja that there were three or four large carp in Walden and that they are welcome because they tend to keep it cleaner than it would be without them. Over the years, I have spotted one or other on occasion from my canoe. 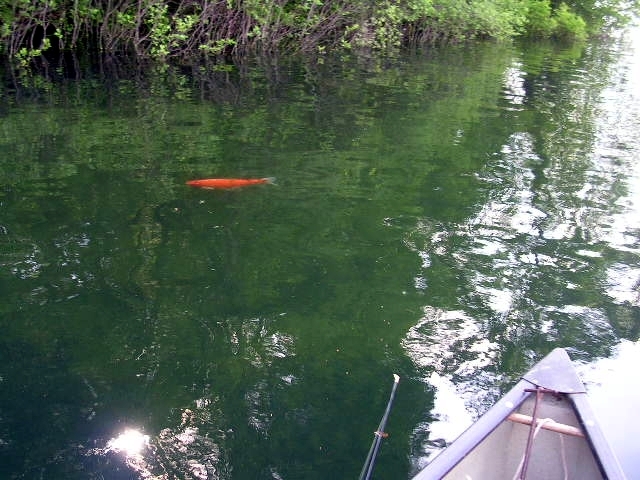 On June 2, 2010, I was paddling to the boat ramp after catching two rainbow trout when I spotted what I would guess is a fairly rare sight: three of them swimming together. 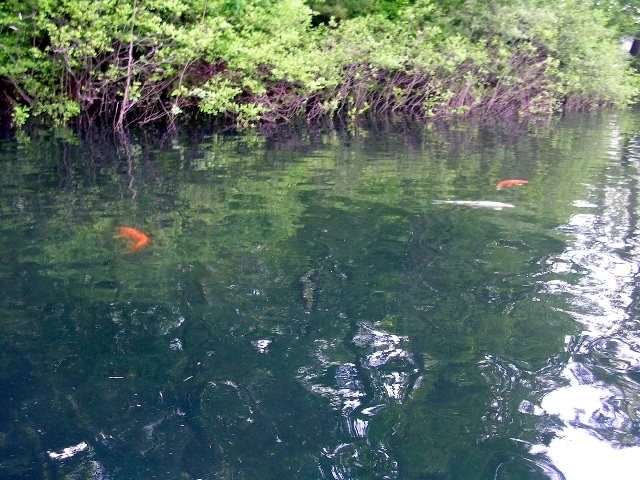 There are two golden fish and one mostly white with spots of gold. Each of these fish is about three feet long! I couldn't help but notice that you referred to the large fish in Walden as goldfish. If they are anywhere near three feet long they are not goldfish but koi, domesticated in Japan from two subspecies of Common Carp, the Western Eurasian and the East Asian. They're all members of the family Ciprinidae, often called the carp or minnow family. The biggest goldfish ever recorded was nineteen inches but usually they're much smaller. Goldfish were domesticated from a different species, the Prussian Carp, and so when they hybridize with koi their offspring are infertile. They don't exhibit the range of colors that koi can have, but they have a greater range of body and fin shapes. The ranger who told you they were carp was correct (assuming that he knows koi are carp) because in Japanese the word koi means carp, and they refer to all carp as koi, whereas English speakers refer to the wild fish as carp and the colorful domesticated fish as koi. It's not surprising that you've seen them over a period of many years since they have not only the longest life span of any fish, but the longest verified life span of any vertebrate, well over two hundred years.